:O! I've been trying to get this palette everywhere. I have the original and the only other one I want is this one. i would love to win it because i always stick to safe neutrals and really need to try out some lovely colours! I'd like to win it because I've never tried Sleek and the colours in this palette are fab! because of this 21st century, society has become chauvanisitic forcing women to cover themseleves in a mask of beauty products,, but i have learnt the hard way that makeup doesnt hide who yu are, but it brings out the features, and you gain new confidence, along with an emboldened personality this has caused me to personally take an interest in other womens make up styles makin sure that i can bring the beautiful side in them so people can appreciate them and know that they too are people who deserve to be acknowledged. with this giveaway, i believe i can help myself and others reach their maximum potential and beautify the world with their presence so i ask of you to give me this giveway so i can help myself and help others. I've been reading great things about these palettes so I really want to try them out. Haven't been able to find them here and I don't use ebay, so it would be perfect to win it. I want it cause I've heard a lot of good things about this palette! It looks very handy and I guess it's ideal to bring it around when I go travel. Enter me! 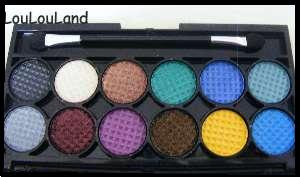 I'd like to get this palette because I have not tried this colors and I'd like to try! I LOVE BRIGHTS! THATS WHY! I want to win because Sleek is not available here in my country. This is a fabulous prize and I would love to win it because I'm off to see my brother in Australia in a couple of weeks. These gorgeous colours would look even better in the bright aussie sunlight!